New to iOS 10, the User Notification framework allows for the delivery and handling of local and remote notifications. Using this framework, an app or App Extension can schedule the delivery of local notifications by specifying a set of conditions such as location or time of day. As stated above, the new User Notification framework allows for the delivery and handling of local and remote notifications. Using this framework, an app or App Extension can schedule the delivery of local notifications by specifying a set of conditions such as location or time of day. Additionally, the app or extension can receive (and potentially modify) both local and remote notifications as they are delivered to the user's iOS device. 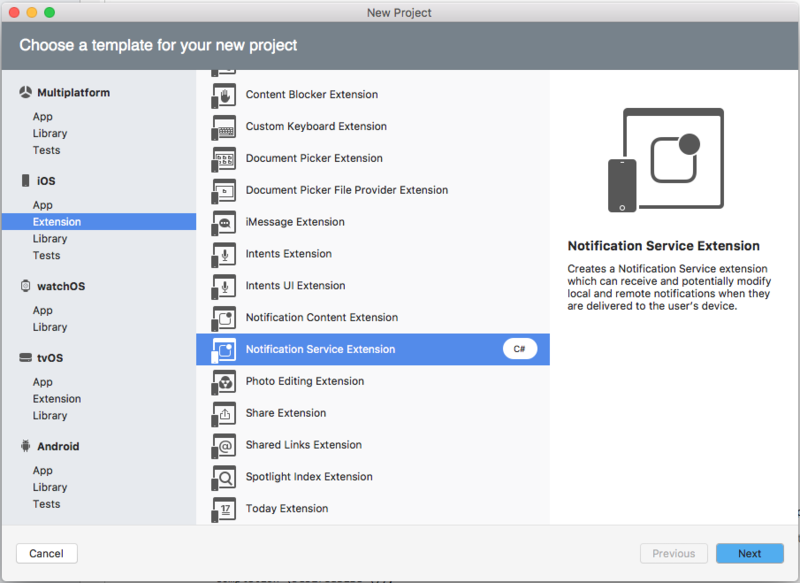 The new User Notification UI framework allows an app or App Extension to customize the appearance of both local and remote notifications when they are presented to the user. Visual Alerts - Where the notification rolls down from the top of the screen as a banner. Sound and Vibrations - Can be associated with a notification. App Icon Badging - Where the app's icon displays a badge showing that new content is available, such as the number of unread email messages. If the device is unlocked, the notification will roll down from the top of the screen as a banner. If the device is locked, the notification will be displayed on the user's lock screen. If the user has missed a notification, they can open the Notification Center and view any available, waiting notifications there. Local Notifications - These are sent by apps installed locally on the users device. Remote Notifications - Are sent from a remote server and either presented to the user or they trigger a background update of the app's content. They are sent by apps that are local on the user's device. They are can be configured to use either time or location based triggers. The app schedules the notification with the user's device and it is displayed when the trigger condition is met. When the user interacts with a notification, the app will receive a callback. For more information, please see Apple's Local and Remote Notification Programming Guide documentation. The app has a server-side component that it communicates with. 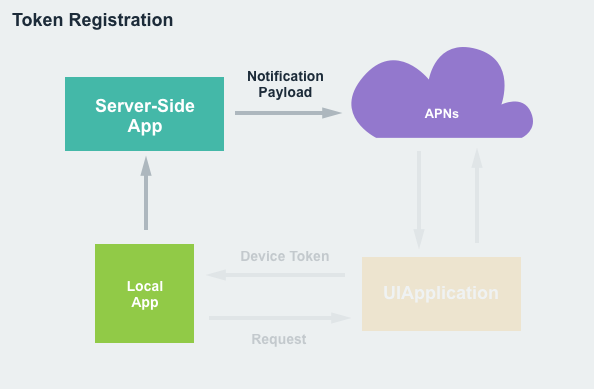 The Apple Push Notification Service (APNs) is used to transmit a best-effort delivery of Remote Notifications to the user's device from the developer's cloud based servers. When the app receives the Remote Notification it will be displayed to the user. When the user interacts with the notification, the app will receive a callback. User Facing - These are displayed to the user on the device. Silent Updates - These provide a mechanism to update the contents of an iOS app in the background. When a Silent Update is received, the app can reach out to the remove servers pull down the latest content. Prior to iOS 10, an iOS app would use UIApplication to register a notification with the system and to schedule how that notification should be triggered (either by time or location). There were different callbacks required for Local or Remote Notifications which could lead to duplication of code. The app had limited control of the notification after it had been scheduled with the system. There were differing levels of support across all of Apple's existing platforms. With iOS 10, Apple has introduced the new User Notification framework, which replaces the existing UIApplication method noted above. A familiar API that includes feature parity with the previous methods making it easy to port code from the existing framework. Includes an expanded set of content options that allows richer notifications to be sent to the user. Both Local and Remote Notifications can be handled by the same code and callbacks. Simplifies the process of handling callbacks that are sent to an app when the user interacts with a notification. Enhanced management of both pending and delivered notifications including the ability to remove or update notifications. Adds the ability to do in-app presentation of notifications. Adds the ability to schedule and handle notifications from within App Extensions. Adds new extension point for the notifications themselves. iOS - Full support to manage and schedule notifications. tvOS - Adds the ability to badge app icons for local and remote notifications. watchOS - Adds the ability to forward notifications from the user's paired iOS device to their Apple Watch and gives watch apps the ability to do local notifications directly on the watch itself. For more information, please see Apple's UserNotifications Framework Reference and UserNotificationsUI documentation. Before an iOS app can send notifications to the user the app must be registered with the system and, because a notification is an interruption to the user, an app must explicitly request permission before sending them. Additionally, these approval levels must be requested and set for both local and remote notifications. Missing Push Notification Entitlement - Your app includes an API for Apple's Push Notification service, but the aps-environment entitlement is missing from the app's signature. Double-click the Entitlements.plist file in the Solution Pad to open it for editing. Click the + button to add a new key. Double-click the Entitlements.plist file in the Solution Explorer to open it for editing. The token acts as the key that ties together the notification and the app used to open or respond to the notification. With the app fully registered and the required permissions requested from and granted by the user, the app is now ready to send and receive notifications. New to iOS 10, all notifications contain both a Title and Subtitle that will always be displayed with the Body of the notification content. Also new, is the ability to add Media Attachments to the notification content. "body":"This is the message body of the notification." Push Notification - Is used exclusively with Remote Notifications and is triggered when APNs sends a notification package to the app running on the device. Calendar Date - Allows Local Notifications to be scheduled for a specific date and time. Location Based - Allows Local Notifications to be scheduled when the iOS device is entering or leaving a specific geographic location or is in a given proximity to any Bluetooth Beacons. When a Local Notification is ready, the app needs to call the Add method of the UNUserNotificationCenter object to schedule its display to the user. 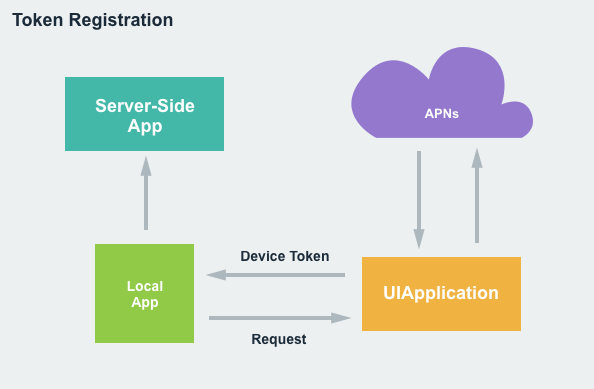 For Remote Notifications, the server-side app sends a Notification Payload to the APNs, which then sends the packet on to the user's device. // `None` to say we have handled the display locally. This code is simply writing out the contents of the UNNotification to the Application Output and asking the system to display the standard Alert for the notification. This code is attaching the custom UNUserNotificationCenterDelegate from above to the current UNUserNotificationCenter so the app can handle notification while it is active and in the foreground. New to iOS 10, Notification Management provides access to both pending and delivered Notifications and adds the ability to remove, update or promote these Notifications. An important part of Notification Management is the Request Identifier that was assigned to the Notification when it was created and scheduled with the system. For Remote Notifications, this is assigned via the new apps-collapse-id field in the HTTP request header. The Request Identifier is used to select the Notification that the app wishes to perform Notification Management on. For already delivered Notifications, the existing Notification will get updated and promoted to the top of the list on the Home and Lock screens and in the Notification Center if it has already been read by the user. In iOS 10, Notifications that are delivered to the user are not static, and provide several ways that the user can interact with them (from built-in to custom Actions). Default Action - This is when the user taps a Notification to open the app and display the details of the given Notification. Custom Actions - These were added in iOS 8 and provide a quick way for the user to perform a custom task directly from the Notification without needing to launch the app. They can be presented as either a list of buttons with customizable titles or a text input field which can run either in the Background (where the app is given a small amount of time to fulfill the request) or the Foreground (where the app is launched in the foreground to fulfill the request). Custom Actions are available on both iOS and watchOS. Dismiss Action - This Action is sent to the app when the user dismisses a given Notification. When creating a new UNNotificationAction, it is assigned a unique ID and the title that will appear on the button. By default, the Action will be created as a Background Action, however options can be supplied to adjust the Action's behavior (for example setting it to be a Foreground Action). Each of the Actions created need to be associated with a Category. When creating a new UNNotificationCategory, it is assigned a unique ID, a list of Actions it can perform, a list of Intent IDs to provide more information about the intent of the Actions in the Category and some options to control the behavior of the Category. Finally, all of the Categories are registered with the system using the SetNotificationCategories method. Once a set of Custom Actions and Categories have been created and registered with the system, they can be presented from either Local or Remote Notifications. Again, this ID needs to match one of the Categories that was created above. The passed in UNNotificationResponse class has an ActionIdentifier property that can either be the Default Action or the Dismiss Action. Use response.Notification.Request.Identifier to test for any custom actions. The UserText property holds the value of any user text input. The Notification property holds the originating Notification that includes the Request with the Trigger and Notification Content. The app can decide if it was a Local or Remote Notification based on the type of trigger. iOS 12 makes it possible for a custom notification UI to modify its action buttons at runtime. For more information, take a look at the dynamic notification action buttons documentation. When working with Remote Notifications, Service Extensions provide a way to enable end-to-end encryption inside of the Notification Payload. Service Extensions are a non-User Interface extension (available in iOS 10) that run in the background with the main purpose of augmenting or replacing the visible content of a Notification before it is presented to the user. Service Extensions are meant to run quickly and are only given a short amount of time to execute by the system. In the event that the Service Extension fails to complete its task in the allotted amount of time, a fallback method will be called. If the fallback fails, the original Notification Content will be displayed to the user. Providing end-to-end encryption of the Remote Notification content. Adding attachments to Remote Notifications to enrich them. 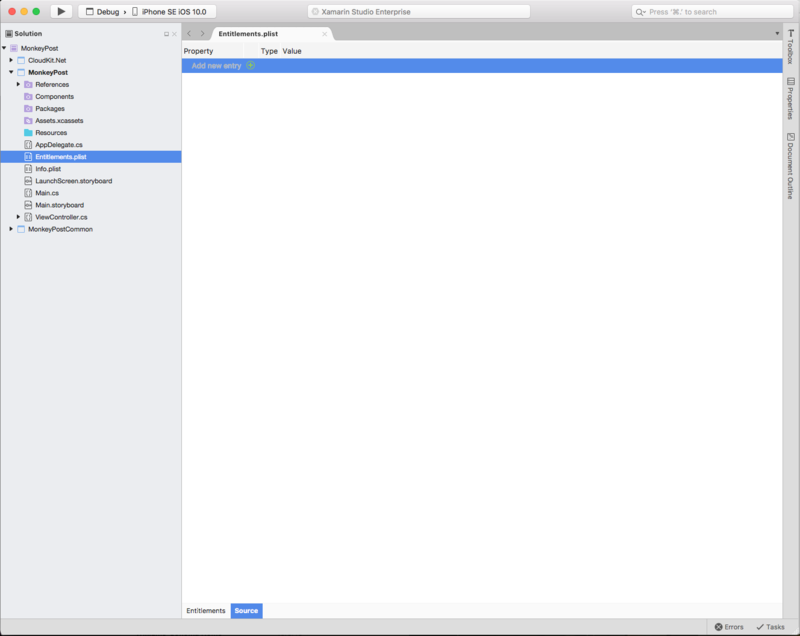 Open the app's solution in Visual Studio for Mac. 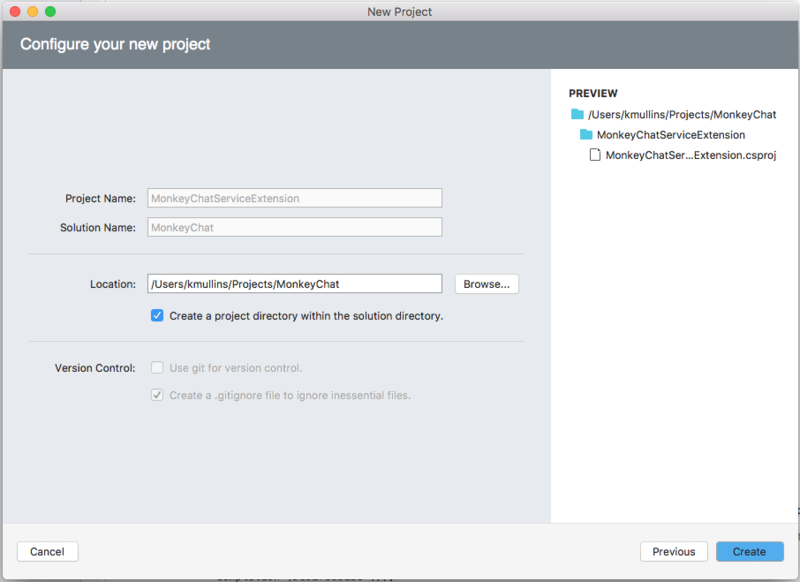 Right-click on the Solution Name in the Solution Pad and select Add > Add New Project. Open the app's solution in Visual Studio. Enter a Name for the extension and click the OK button. The Bundle Identifier for the service extension should match the Bundle Identifier of the main app with .appnameserviceextension appended to the end. For example, if the main app had a Bundle Identifier of com.xamarin.monkeynotify, the service extension should have a Bundle Identifier of com.xamarin.monkeynotify.monkeynotifyserviceextension. This should automatically be set when the extension is added to the solution. 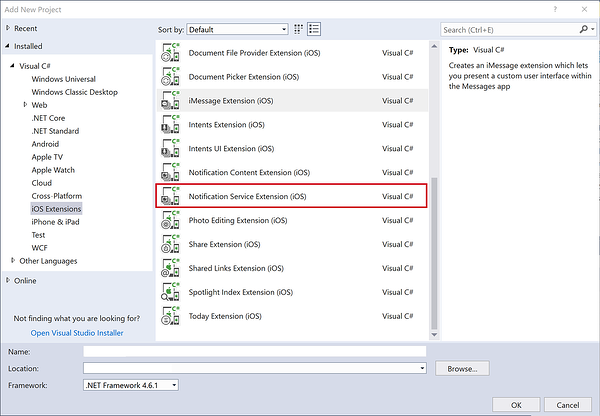 The first method, DidReceiveNotificationRequest, will be passed the Notification Identifier as well as the Notification Content via the request object. The passed in contentHandler will need to be called to present the Notification to the user. The second method, TimeWillExpire, will be called just before time is about to run out for the Service Extension to process the request. If the Service Extension fails to call the contentHandler in the allotted amount of time, the original content will be displayed to the user. The new mutable-content key specifies that the Service Extension will need to be launched to update the Remote Notification content. The encrypted-content key holds the encrypted data that the Service Extension can decrypt before presenting to the user. This code decrypts the encrypted content from the encrypted-content key, creates a new UNMutableNotificationContent, sets the Body property to the decrypted content and uses the contentHandler to present the notification to the user. This article has covered all of the ways that Users Notification have been enhanced by iOS 10. 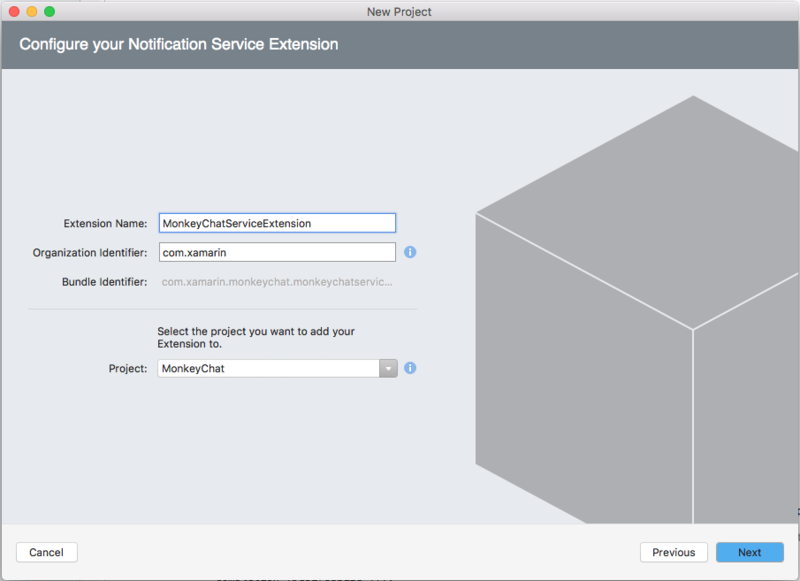 It presented the new User Notification framework and how to use it in a Xamarin.iOS app or App Extension.